Invasive fusariosis (IF) is a rare but often fatal fungal infection in immunosuppressed patients. In 2007, cases of IF above the expected epidemiologic baseline were detected in the hematology ward of a hospital in Rio de Janeiro, Brazil. Possible sources of infection were investigated by performing environmental sampling and patient isolate collection, followed by molecular typing. Isolates from dermatology patients with superficial fusariosis were included in the study for comparison to molecular types found in the community. Environmental sampling focused on water-related sources in and around the hematology ward. Initially, we characterized 166 clinical and environmental isolates using the Fusarium translation elongation factor 1α (EF-1α) genetic locus. Isolates included 68 collected from water-related sources in the hospital environment, 55 from 18 hematology patients, and 43 from the skin/nails of 40 outpatients seen at the hospital dermatology clinic. Multi-locus sequence typing was performed on Fusarium solani species complex (FSSC) species 1 and 2 isolates to investigate their relatedness further. Most of the hematology samples were FSSC species 2, with species type FSSC 2-d the most commonly isolated from these patients. Most of the outpatient dermatology samples were also FSSC 2, with type 2-d again predominating. In contrast, environmental isolates from water sources were mostly Fusarium oxysporum species complex (FOSC) and those from air samples mostly Fusarium incarnatum-equiseti species complex (FIESC). A third of the environmental samples were FSSC, with species types FSSC 1-a and FSSC 1-b predominating. Fusarium isolate species types from hematology patient infections were highly similar to those recovered from dermatology patients in the community. Four species types (FSSC 1-a, 1-b, 2-d and 2-f) were shared between hematology patients and the environment. Limitations in environmental sampling do not allow for nosocomial sources of infection to be ruled out. Future studies will focus on environmental factors that may have influenced the prevalence of FSSC fusariosis in this hematology ward. Over the last two decades, invasive mold infections have become increasingly common among severely ill hospital patients worldwide [1, 2]. Fusariosis may manifest as superficial or skin, nail and eye infections in healthy persons, whereas severely immunocompromised patients can develop invasive disease [2–5]. Invasive fusariosis (IF) is a devastating fungal infection with high mortality rates in patients with hematological malignancies and in hematopoietic stem cell transplant recipients . Since 2005, an increase in cases of fusariosis was observed in a hospital in Rio de Janeiro, Brazil, both among immunosuppressed patients in the bone marrow transplant unit (BMTU) and also among persons with superficial infections who were treated at the local dermatology clinic. In 2007, the number of cases of fusariosis in the BMTU above the expected epidemiologic baseline was recorded. Periodic environmental sampling in the hospital, focused on water and water-related sources within the BMTU, commenced in 2005 and was continued until 2009, in an attempt to identify possible environmental reservoirs of infection. Beginning in 2006, Fusarium isolates from hospital patients, hospital environmental samples, and dermatology clinic patients were archived for further molecular analysis. Here we report the results of comparative sequence typing performed on these archived isolates to assess the ecology of the hospital environment, determine the molecular genetic relatedness between patient and environmental samples, and to estimate the degree to which environmental Fusarium could be a reservoir for infection within the hospital. This study was conducted in the University Hospital, Federal University of Rio de Janeiro, Brazil. The University Hospital is a 13-floor tertiary care teaching hospital with ~480 beds. The BMTU is an isolated 18-bed ward located on the eighth floor of the building. Rooms in the BMTU are under positive pressure air flow, and 8 beds have high-efficiency particulate air (HEPA) filters. Sporadic cases of IF had been diagnosed in the BMTU at a rate of 1.47 cases per 1000 admissions between 2000 and 2006. In 2007, there was a sharp increase in the rate of fusariosis, reaching 16.78 cases per 1000 BMTU admissions. During this period, there was a concurrent increase of superficial fusariosis in outpatients seen at the dermatology clinic on the hospital’s second floor. Fifty-five Fusarium isolates were recovered from 18 hematology patients (38 isolates from sterile site samples and 17 from non-sterile sites) in the BMTU as a part of standard medical care between December 2005 and September 2009. Forty-three Fusarium isolates were collected from skin and nail cultures of superficial lesions (onychomycosis and intertrigus) of 40 dermatology outpatients between June 2007 and October 2009 as part of standard medical care. After collection, all patient isolates were plated on Sabouraud dextrose agar (SDA), Mycosel, brain/heart infusion (BHI), and yeast extract agars and incubated at 25°C. Hospital environmental sampling was performed periodically in the BMTU between June 2005 and Aug 2006 as part of an environmental surveillance program focused on air, water, and water-related surfaces. In September 2006 - October 2007, environmental sampling was performed in rooms of infected patients, with an emphasis on bathroom surfaces (shower heads, drains, and tile grout and sink surfaces and drains). Common areas of the BMTU were also swabbed as potential point sources of fungal contamination. Thereafter, routine environmental surveillance of the BMTU continued through July 2009. Environmental sampling of the outpatient dermatology clinic was not performed. Surfaces were sampled using Culturette swabs (Becton Dickinson, Franklin Lakes, NJ, USA), inoculated onto SDA plates containing 50 mg/L chloramphenicol (SDA+C), and incubated at 25°C. Water (100 ml) was collected in sterile glass bottles and was filtered through 0.45 μm membranes (Millipore, Billerica, MA) which were placed on SAB plates and incubated at 25°C. Air was sampled from patient rooms in November 2006, August 2007, and July 2009 using a six-stage Anderson bioaerosol sampler (Anderson Instruments, Atlanta GA) with air impacting on an SDA plate for 30 min, for a total volume of 849 L per sample. Control air samples were also collected from other areas of the hospital, including the intensive care unit (2005, 2007 and 2009), pediatrics unit (2007) and the nephrology dialysis unit (2007). Fusarium were isolated from 68 samples, ranging in time of collection from June 2005 to October 2009. Provisional identification of hematology patient Fusarium isolates were obtained in order to decide if more dramatic measures should be implemented in the BMTU. This identification was based on the micromorphology that is typical of this genus . All available Fusarium isolates collected from patients and the environment were sent to the Centers for Diseases Control and Prevention, Atlanta, GA, USA for molecular identification. At the CDC, isolates were sub-cultured on SDA+C with 50 mg/ml gentamycin agar, and incubated at 30°C for approximately 72 hours. Genomic DNA was extracted using the Qiagen DNeasy tissue kit (Qiagen, Valencia, CA) with slight modifications to the manufacturer’s instructions. Briefly, small sections of sub-cultured Fusarium (1 cm2) were cut from mycelial mats and placed in 5 ml polypropylene tubes containing 900 μl Qiagen ATL buffer and 60 U proteinase K. The mycelia in each tube were homogenized using the Omni TH Mixer (Omni Intl., Kennesaw, GA) at slow speed for 30 s and then high speed for 30 s, using a clean probe between each isolate. Homogenates were capped and incubated at 55°C for 1 h with frequent vortexing and then cooled to RT. RNase A (Sigma-Aldrich Corp., St. Louis, MO) was then added to a final concentration of 1 mg/ml and incubated for 5 min at RT, followed by the addition of 900 μl Qiagen buffer AL and vortexing. Homogenates were incubated at 70°C for 10 min, then transferred to 1.7 ml microcentrifuge tubes and centrifuged at 15,000 X g for 10 min. Clear supernatants (1 ml each) were transferred to clean microcentrifuge tubes and 500 μl ethanol (Sigma-Aldrich Corp.) was added. The suspensions were vortexed and transferred to Qiagen DNeasy columns, and manufacturer’s instructions were followed throughout the remainder of the procedure. A region of the translation elongation factor-1α (EF-1α) gene was used to resolve all Fusarium isolates to the species complex level  [Genbank: HM852032-HM852059]. Multi-locus sequence typing (MLST) was performed on selected isolates. 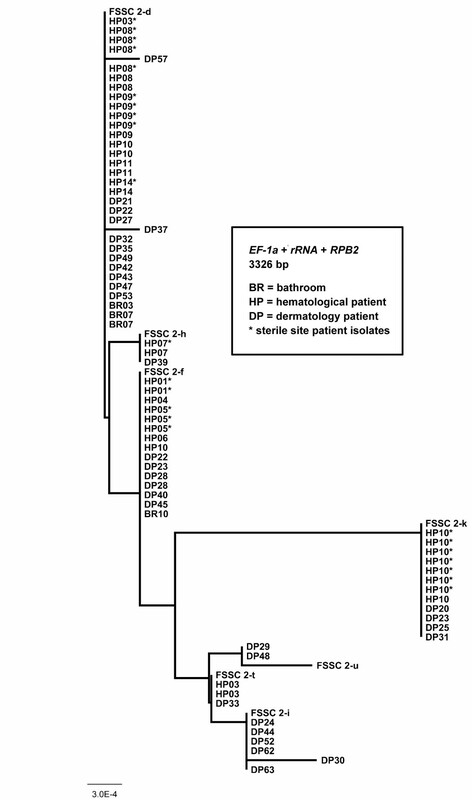 The EF-1α and two additional genetic loci, the internal transcribed spacer (ITS) including D1/D2 and large nuclear subunit (LSU) rRNA regions (rRNA) and a portion of the RNA polymerase II subunit (RPB2) gene, were amplified using primers described by O’Donnell et al. to determine species type (ST)  (Table 1). Additional primers were developed for this study to sequence the 5’ (F2F and F1R) and 3’ (40-2f and 40-r) of RPB2 (Table 1). PCR was performed in 25 μl reactions containing 0.2 μM each forward and reverse primer, 2.5 mM MgCl2, 0.2 mM each dNTP, and 0.625 U Taq DNA Polymerase (Roche Carolina Inc., Florence, SC) in a buffer of 10 mM Tris pH 8.3/50 mM KCl. Thermal cycling was performed in MicroAmp 96-well optical reaction plates using the GeneAmp PCR System 9700 (Applied Biosystems, Inc., Foster City, CA) for forty cycles as follows: 94°C for 5 min, 10 cycles of 94°C for 30 s, 60°C for 30 s (decreasing 1°C each cycle), 72°C for 30 s; then 30 cycles as above, but with the annealing temperature held at, 50°C for 30 s, and a final step of 72°C for 5 min. Amplicons were sized on 1.75% agarose and visualized with ethidium bromide under ultraviolet light. Amplicons were purified using Exo-SAP-IT (USB Corp., Cleveland, OH) according to manufacturer’s instructions, followed by sequencing with locus-specific primers using the BigDye Terminator v3.1 Cycle Sequencing Kit (Applied Biosystems Inc.) in a 3730 DNA Analyzer (Applied Biosystems, Inc.). Consensus sequences were generated from raw data using Sequencher 4.9 software (Gene Codes Corp., Ann Arbor, MI). † Letter designations for degenerate bases: R, A or G; S, C or G; W, A or T; Y, C or T.
Fusarium species complexes and STs were identified using the FUSARIUM ID database BLAST search feature  [Genbank: JX156437-JX15644, Genbank: JX282603-JX282609]. Consensus sequences were aligned using Clustal W and cleaned within the BioEdit Sequence Alignment Editor [9, 10]. Neighbor-joining (NJ) trees were generated using Kimura’s two-parameter model and bootstrapped using 1000 random replicates with the Phylip 3.69 software package . Resultant trees were then analyzed to generate a consensus NJ tree that was annotated using FigTree v.1.3.1 software . Maximum Likelihood (MJ) and Maximum Parsimony (MP) algorithms were used to generate alternate trees for comparison to the NJ tree to ensure its validity. A total of 166 Fusarium isolates were available for analysis. These included 98 clinical isolates (55 from 18 hematological patients, 43 from 40 dermatology patients) and 68 isolates from environmental samples, including 14 air samples, 44 swab samples, and 10 water samples. Comparative EF-1α sequence analysis using the FUSARIUM ID database BLAST feature allowed for identification of most study isolates to the species level, with sequence identities ranging from 94.1% to 100% (mean = 99.9, median = 100%) when compared with database isolates. Frequencies of different species complexes/species isolated from patients and the environment are shown in Figure 1. Isolates from BMTU patients and dermatology patients showed a similar distribution. The majority of isolates (68%, 113/166) were identified as Fusarium solani species complex (FSSC). 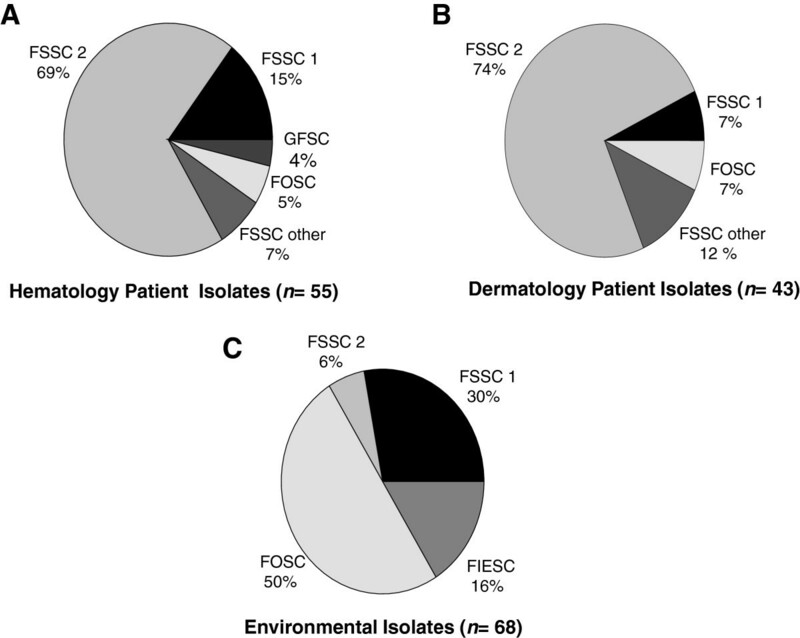 Among clinical isolates, FSSC species 2 (FSSC 2) predominated, and comprised 69% (38/55) of those collected from hematology patients, and 74% (32/43) of those collected from dermatology patients (Figure 1). Fusarium oxysporum species complex (FOSC) isolates were found in much greater numbers in the hospital environment (50%, 34/68) than in those collected from hematology (5%, 3/55) and dermatology (7%, 3/43) patients. Gibberella fujikuroi (GFSC) were isolated exclusively from hematology patients and Fusarium incarnatum-equiseti (FIESC) exclusively from environmental sources. FSSC 1 and FSSC 2 clinical and environmental isolates shared between 99.7 -100% EF-1α identity with FUSARIUM ID isolates, and were chosen for MLST due to their predominance in patients. Molecular typing of Fusarium isolates ( n = 168) collected from patients and the environment. Molecular typing to species complexes and species was accomplished by amplification and genetic sequencing of the translation elongation factor 1α (EF-1α) gene. Identities of study isolates were resolved by comparison of EF-1α molecular sequences to sequences of known Fusarium species archived in a in a curated database, FUSARIUM ID . FSSC: Fusarium solani species complex; FOSC: Fusarium oxysporum species complex; FIESC: Fusarium incarnatum-equiseti species complex; GFSC: Gibberella fujikuroi species complex. Species type identifications of 104 FSSC isolates (FSSC 1 = 30, FSSC 2 = 74) by MLST and EF-1α species complex/ species identification (42 isolates) are shown in Table 2. The cladogram in Figure 2 represents all FSSC 2 isolates described in this study. No cladogram was prepared for FSSC 1-a and 1-b isolates, since these STs differ by only one base pair. † Species identity not determined due to multiple genetic matches. Note: Each isolate was given a unique isolate number. Isolate sources have designations as follows: BR (bathroom), HP (hematology patient), DP (dermatology patient), followed by a source number. In many cases, more than one isolate was collected from the same source. Abbreviations: FSSC, Fusarium solani species complex;FOSC, Fusarium oxysporum species complex; FIESC, Fusarium incarnatum equiseti species complex; GFSC, Gibberella fujikuroi species complex. Neighbor-joining phylogeny of Fusarium solani species complex (FSSC) species 2 isolates ( n = 74). Bootstrap values were 100% between individual taxa (1000 iterations, data not shown). Included are previously described FSSC species 2 voucher sequences (labeled FSSC 2-d, FSSC 2-f, FSSC 2-h, FSSC 2-I, FSSC 2-k, and FSSC 2-u) that were retrieved from the FUSARIUM ID database . FSSC 2-d and FSSC 2-f were the most common STs isolated from patients (Figure 2). FSSC 2-d was collected from seven patients in the BTMU (20 isolates) and 12 dermatology outpatients, while FSSC 2-f was isolated from five BTMU patients (8 isolates) and five dermatology outpatients (6 isolates). FSSC 2 isolates were rarely found in the environment (n = 4); two FSSC 2-d isolates were collected from the same water source (BR07) on the same day, one FSSC 2-d was isolated from an air sample (BR03), and FSSC 2-f was collected from a floor swab of BR10. None of the environmental FSSC 2 isolates were collected within the same month as those collected from patients in the BMTU (Table 2). FSSC 2-k (1 patient, 8 isolates) and FSSC 2-t (1 patient, 2 isolates) were the other STs identified by MLST in the BMTU, but none were collected in the environment (Figure 2). Other Fusarium isolated in hematology patients were provisionally identified by EF-1α sequence comparison and each was found in one BMTU patient. These were FSSC 3+4 (HP16, corneal swab), FSSC 7 (HP15, blood), FOSC 33 (HP13, blood and catheter tip), GFSC (HP12, blood), and unspeciated FSSC (HP01, blood) and FOSC (HP15, skin) (Table 2). Among environmental isolates, FOSC 33 comprised almost half of all samples collected, and was isolated 32 times between September 2006 and July 2009, with the majority (24) sampled between August and October 2007. This species was found in water-related surface swabs of all 12 BMTU bathrooms, a nephrology wall swab (control), and water of two bathrooms (BR02, BR07). FOSC 33 was also isolated from blood and a catheter tip of a patient (HP13) in October 2008, but none were collected from the environment that month (Table 2). Forty-three bathroom swabs were performed between September 2006 and July 2009, and 6 different Fusarium species/STs were recovered; FOSC (unknown species) and FOSC 33, FSSC 1-a, 1-b, 2-d, and 2-f. Water samples positive for Fusarium (n = 10) were collected in four bathrooms (BR01, 02, 03, 07) and yielded four STs; FOSC 183, FOSC 33, FSSC 1-b and FSSC 2-d. Only BR01 and BR07 were positive for FSSC (1-b, and 2-d, respectively), and water in these rooms also yielded FOSC STs. FIESC was collected from air in three bathrooms (BR03, BR04, BR06) and from 8 control samples. Three other STs were found in air, FSSC 1-a, 1-b, and 2-d, and all were collected from BR03. Given the severe morbidity and mortality from Fusarium infections, it is important to understand the sources of these organisms and determine the extent to which fusaria may be transmitted in the hospital. One such study by Anaissie in 2001 implicated hospital water systems (drains, faucet aerators, shower heads) as potential reservoirs for Fusarium, and suggested that these fungi can be transmitted through the water system due to their persistence in plumbing systems . In the United States, Short et al. recently confirmed these findings by performing an extensive MLST study of fusaria recovered from plumbing drains in the United States . They found that the 6 most common sequence types in drains (FSSC 1-a, 1-b, 2-d, 2-k, FOSC 33 and Fusarium dimerum) were also the six most commonly associated with human infection. Our study bolsters the findings of Short et al. with regard to common Fusarium STs isolated from water-related sources, since we also found that FOSC 33 was the most common ST isolated in drains, faucets, and tiles of showers and sinks in the hospital. Unlike Short et al., we found FSSC 1-a and FSSC 1-b to be more commonly found in these sources, as opposed to FSSC 2-d. Our study differs in two ways, however, since environmental sampling was conducted in Brazil, and only exterior plumbing surfaces were sampled. Several studies have shown that MLST of three loci (EF-1α, rRNA and RPB2) have the highest discriminatory power in delineating FSSC using comparative sequence analyses [7, 15, 16]. We used this three-locus method and found that subtypes of most BTMU inpatient clinical isolates belonged to FSSC species 2 (69%, 38/55), and were primarily 2-d (recovered from 36% of patients) and 2-f (recovered from 18% of patients). In contrast, FSSC isolates comprised 36% of the environmental samples and were shown to be predominantly species type 1-a (18%) and 1-b (13%), while only four environmental samples were FSSC 2. The remaining environmental samples were predominantly FOSC from swabs and water (50% of environmental samples) and FIESC from air (79% of air samples). We did not find any FIESC clinical isolates, although we did find two FOSC clinical cases. Our data suggest that most of the clinical cases of fusariosis in this immunosuppressed population could not be traced to a specific water-related environmental source in the hospital ward. However, because we found a small number of species type-level matches between clinical and environmental isolates, we believe that in this institution, environmental water-related sources and even air must be considered as possible reservoirs for patient infection. In this study, we were unable to find any temporal association between BMTU patient fusarial infections and contaminated water-related sources in the BMTU environment. We explored the epidemiology of community acquisition by studying a population of dermatology outpatients diagnosed with skin or nail fusariosis who were seen at the hospital during the same period. The spectrum of Fusarium STs recovered from these patients largely mirrored those recovered from BMTU inpatients (Figure 1). A study by Raad et al. used RAPD subtyping to demonstrate that Fusarium DNA collected from 10 infected patients did not match DNA from 15 environmental isolates collected from shower head water, sink water, and drains in their institution . Our study was far more extensive and yielded similar results. Both Anassie and Short [13, 14] have implicated water systems as reservoirs of fusariosis, but in our study we found only FSSC 1 to be common in both hematology patients and the environment. It is possible that Fusarium patient subtypes could have been missed in the hospital environment because of limitations in the environmental investigation. Environmental sampling was sporadic and was limited in scope, so potential sources of contamination may have been missed. Few samples were collected from air in the BMTU, and surfaces of other fomites in the patient rooms were not sampled; rather focus was placed on the patient bathrooms, pursuing the hypothesis that water-related sources were Fusarium reservoirs. Additionally, the methods used for environmental sample collection may not have been optimal for Fusarium recovery. The diversity of Fusarium STs among dermatology patients with superficial infections was greater than that of BMTU patients, and the distribution of STs was highly similar between these patient populations. We found that a single species, FSSC 2-d, predominated in both inpatient hematology and outpatient dermatology samples. Certainly, our combined patient data suggest that FSSC species remain a cause of superficial colonization, and under appropriate circumstances of immunosuppression, could cause disease in an IHC patient population. The increase in fusariosis in this and other hospitals (personal communication, Marcio Nucci) suggests that there may be a significant increase in circulating Fusarium conidia in this geographical region. Our findings raise important questions for future research, including a search for the environmental reservoirs of Fusarium spp., an explanation for this surge of environmental Fusarium, and the potential implications of these findings in infection control measures. We isolated similar Fusarium species in this hospital and outpatient setting. The limited environmental investigation coupled with molecular analysis did not show a definitive link to clinical isolates causing infection. Future studies are needed in order to identify reservoirs of Fusarium in the community, as well as preventive measures for patients at high risk for IF. Christina M Scheel, Steven F Hurst, Gloria Barreiros, Tiyomi Akiti, Marcio Nucci and S Arunmozhi Balajee contributed equally to this work. We thank Joyce Peterson of the Mycotic Diseases Branch Reference Team for subculture, morphological identification and archiving of Fusarium isolates, and the Division of Foodborne, Waterborne, and Environmental Diseases Genomics Unit for performing sequencing of Fusarium isolate loci. SAB, MN and CMS conceived the study design and prepared article draft. CMS and SFH performed PCR and molecular analysis. GB and TA performed environmental sampling, fungal isolation and cultures. MN provided patient care and management and patient isolate collection. All authors contributed to, reviewed, and approved the final draft of this article.